ASP.NET Web API map HTTP verbs to an action method. The Web API actions must follow prescribed signatures in order to work as expected. For example, a Web API method handling POST requests usually takes a single parameter. More often than not this parameter is of a complex type that wraps the actual pieces of data in its properties. This arrangement goes well when you know the exact model being passed by a client (see below). However, this arrangement is of no use when a client is sending arbitrary pieces of data not mapping to any model. Luckily, Web API provides a way to deal with such data. This article discusses just that. Consider a case where a Web API is expecting data to be inserted in a table from a client. The data in question consists of arbitrary pieces of information and can't be mapped to a predefined model class. In such cases you can make use of FormDataCollection class. The FormDataCollection class resides in System.Net.Http.Formatting namespace and represents a dictionary of arbitrary keys and values. The FormDataCollection class should not be confused with the FormCollection class of ASP.NET MVC. They reside in different namespaces. The FormDataCollection resides in System.Net.Http.Formatting whereas FormCollection resides in System.Web.Mvc namespace. The Post() method shown above takes a parameter of type FormDataCollection. 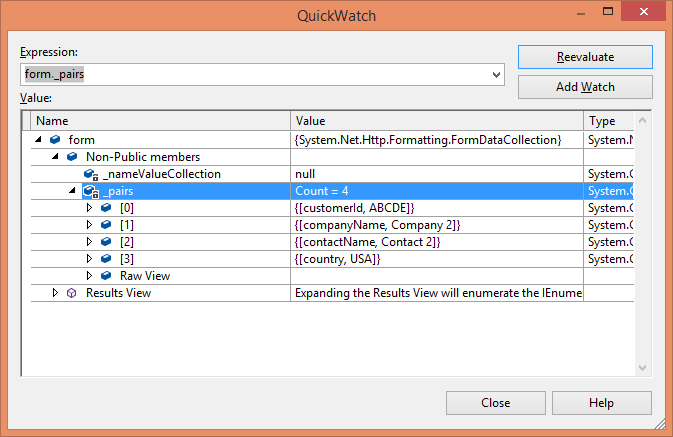 To read the values from this collection you use Get() method and specify a key name. In the above code the client is sending Customer details such as CustomerID, CompanyName, ContactName and Country. Based on these details a Customer object is formed and added to the Customers DbSet. The changes are saved to the database using SaveChanges(). The Post() method then returns a success method to the client. Once the data object created $.post() method of jQuery is used to call the Web API and the data object is passed to it. The success function displays the message returned from the Web API. If you run this application you will see the customerID, companyName, contactName and country values in the FormDataCollection.